Why Not Our Indigenous Heritage in Grenada? It is one thing to accept assistance from friendly nations, especially at a time when the Government understandably has to stretch limited resources a long way to keep the nation afloat. But that does not mean that we should carelessly surrender our right and responsibility to shape our national landscape in our own image. I do not know, whether the NCHAC (National Cultural and Heritage Advisory Committee) was involved in any of this — someone in authority or a relevant organization should have been properly placed to have some sort of discussion and contribute. Grand Etang is one of the most valuable, and important natural heritage sites on our island. For those who consider heritage matters irrelevant, the lake is also of practical importance to the country, because it supplies large quantities of water to the densely populated south of the island. It is a virtual lifeline, and one of Grenada’s physical wonders. A premier attraction, tourists visit and will continue to frequent the lake’s environs in the future, taking in the special atmosphere and scenery and departing, hopefully, with a memorable impression of having enjoyed something special that Grenada has to offer visitors. Therefore a trip to the lake should in fact be a wholly Grenadian experience. We already have an established hiking trail leading up to Mt Qua Qua and Fédon’s camp that runs by the lake’s western shore. Why could we not have designed the new, or refurbished pagodas to look like something representative of the period when Julien Fédon existed in Grenada? Fédon after all, was a Grenadian legend whose historical exploits are steeped in folklore, and significantly, his last redoubt was situated not far from the lake. If a friend or acquaintance is desirous of buying a gift for someone’s living room, both prudence, and a sense of respect should necessitate that they first check with somebody in the house to get an idea of what the person wanted, to ensure that their proposed gift would not only fit in with, but also complement the other furnishings that are already in place in the living room. We call on the relevant authorities to stay on top of these circumstances in the future. This is not a matter of showing ungratefulness towards friends granting needed assistance. But the local Heritage or Government planning organizations should be included, and afforded an opportunity to make direct inputs into developments like the pavilion designs, whenever a national treasure like Grand Etang lake is being modified or upgraded in any form or fashion. 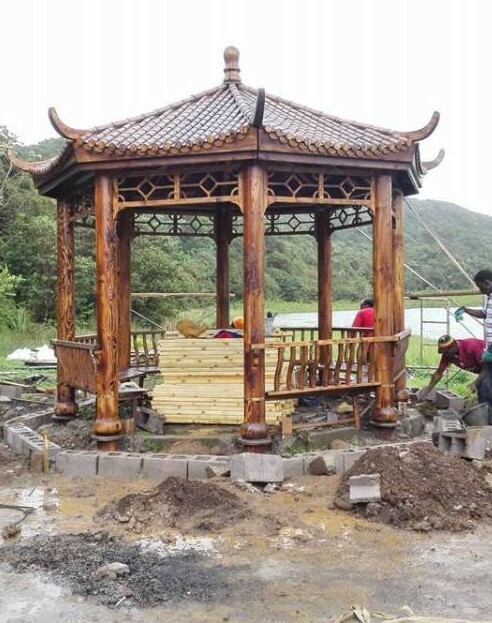 However if in 2015, 41 years after our Independence, we still have no idea as to what is appropriate for our own environment and that no guidance was given as to what we wanted to see erected at OUR lake site, then, I suppose we cannot blame the Chinese for building the pavilions in their own likeness.